vegetables | Violet Makes Things. Food, Crafts & Other Random Things! This carrot cake would have tasted better if I had pulled together a home made frosting for it – but, instead, I used some “cream cheese flavour” frosting from a can. I’m not going to lie – even with subpar frosting, this cake totally hit the spot. It’s SO carrot-y that it’s a bizarre shade of orange and brown (from the cinnamon and nutmeg) and so incredibly moist! Preheat your oven to 325°F. Line a 9”x 13” sheet pan (or two 9″ pans) with parchment paper. In a medium bowl, mix the flour,baking soda, baking powder, salt, cinnamon, and nutmeg. In a large bowl (or in your stand mixer bowl) mix together eggs, oil, sugars, and vanilla until well combined. Add the dry ingredients to the wet ingredients. Mix until well-combined. Pour the batter into the prepared cake pan and bake for approx. 45 to 50 minutes. Cake is done when a skewer in the middle is not goopy. You could add a cup of nuts and/or a cup of raisins to this if you felt like getting crazy with things. I am not a huge fan of raisins and was totally not surprised when I discovered that mine had expired a year ago – and decided not to use them. This cake is really, really moist because it is full of oil. If you’re the sort of person who prefers to eat a bit lighter in the calorie department, consider swapping out some of the oil for some applesauce. 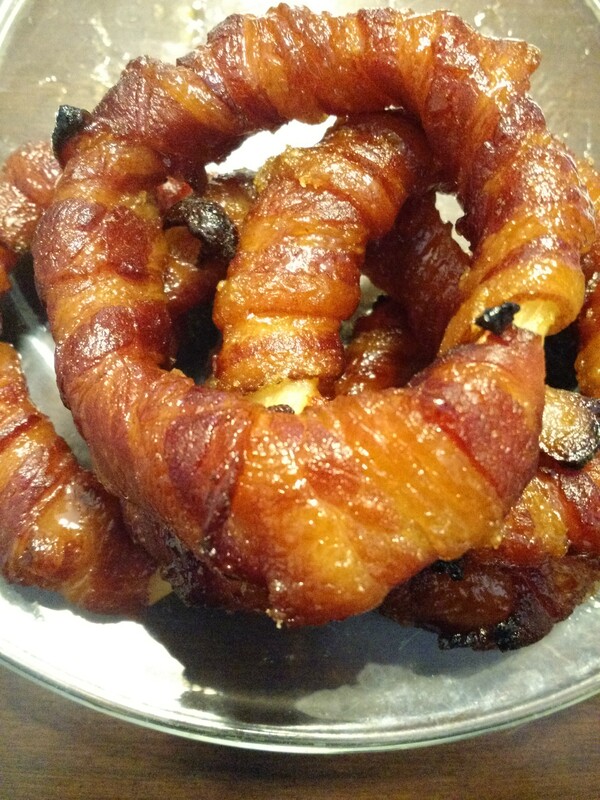 Sriracha Brown Sugar Bacon Wrapped Onion Rings. My friend Kevin is gleefully married to Brenna (who bakes). Together, they make all sorts of delicious foods. When Kevin posted a photo of this recipe on Facebook, I kind of lost my mind and immediately asked my husband (who was out grocery shopping) to please bring home some onions and some bacon. The original recipe called for Vidalia onions – which, for those unaware, are a trademarked onion. This is why it’s hard to find them at some stores, or at various points in the year. Whenever you see a recipe that specifies Vidalias, you can pretty much always substitute a “sweet onion” (of whatever type). The only caveat is that Vidalias are usually very large, so you may need to pick up an extra sweet onion to compensate for them being smaller. Enough talking, let’s make these delicious onion rings! Preheat your oven to 400F and make sure the rack is in the middle of the oven. Line a baking sheet with foil, place a cooling rack on top, and lightly spray the cooling rack with non-stick spray. Peel the onions and cut them into 1/2 inch rings. Do not separate the rings. Set aside. Place the brown sugar in a shallow pan (pie plate, brownie pan) and break up any chunks. Place the Sriracha in a bowl. Find a basting brush. If you’re an organized person, you’ll know where that brush is. For everyone else, look through all of your drawers until you find one shoved into the back behind the turkey baster. Separate the onion rings into double slices (two rings that fit together). Keep only the larger sizes of rings – you can use the smaller rings For this dish you want the larger rings. The smaller, inner rings you can set aside and use in another dish or compost or put in your sandwich. Whatever works for you. Take 2 strips of bacon and dredge them through the brown sugar, making sure to coat both sides. Here’s hint number one: the more brown sugar, the sweeter and gooey these will be – and the more likely your oven will start to billow smoke halfway through cooking. We all make choices and we live with them. Using your basting brush, paint the sriracha sauce all over the onion ring. Make sure you’re still keeping the two rings together – no need to get between them with the sriracha! Wrap the bacon around the onion – overlap slightly and keep it snug (but not too tight). The bacon will shrink a bit during cooking. It will take two slices to go around the ring fully. Don’t overlap too much because the bacon underneath won’t cook as well if you layer it. Set each wrapped-up onion onto the rack. Space them out nicely. Admire them. Note how they look a lot like bacon-wrapped donuts. Appreciate that fact. Place the tray into the oven and bake for 20 minutes. When the timer dings, gently flip each ring over. Cook for another 15-20 minutes. You know how bacon looks when it’s cooked perfectly? That’s how you’ll know when these are ready to come out of the oven. When they’re ready, take them off of the trays and put them onto a plate. They will be super soft and gooey (very gooey, if you used a lot of brown sugar). The bacon will get crispier as it sits, assuming you don’t just burn the hell out of your hands and mouth by eating these as soon as they hit the plate. We basically created a room full of smoke by using a pretty substantial amount of brown sugar (that subsequently dripped down onto the tray and burned). To prevent this, you can either use less brown sugar (what?!) or you could switch out the lower tray for a clean one after the first 20 minutes of cooking. 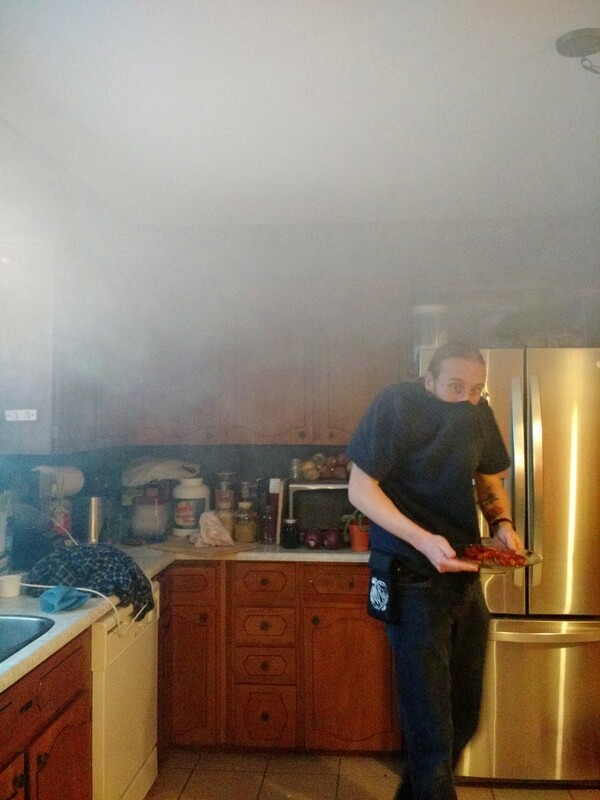 Here’s a photo of my husband in our smoke-filled kitchen. A teensy bit of smoke. No biggie. Doesn’t look too fancy, right? There are recipes all over the internet for something called “Cowboy Candy”. This recipe is pretty much the same thing – it’s just that I’m a lady, I’m the one who makes these, and I love these sweet and spicy jalapenos. So, y’know, that makes them Cowgirl Candy in my books. Cowgirl Candy is delicious in nachos, on burgers, on their own, with cream cheese on a cracker, on their own, in soups or casseroles, on their own.. you can find plenty of uses for them if you like spicy sweet foods. It is not actually candy. This will not fool your kids. This recipe makes approximately 7 (250mL) jars of candy, depending how tightly you pack ’em, and will also leave you with approximately one jar of delicious jalapeno syrup to add to mashed potatoes, swirl into your quinoa bake, or to use as a marinade for meat. 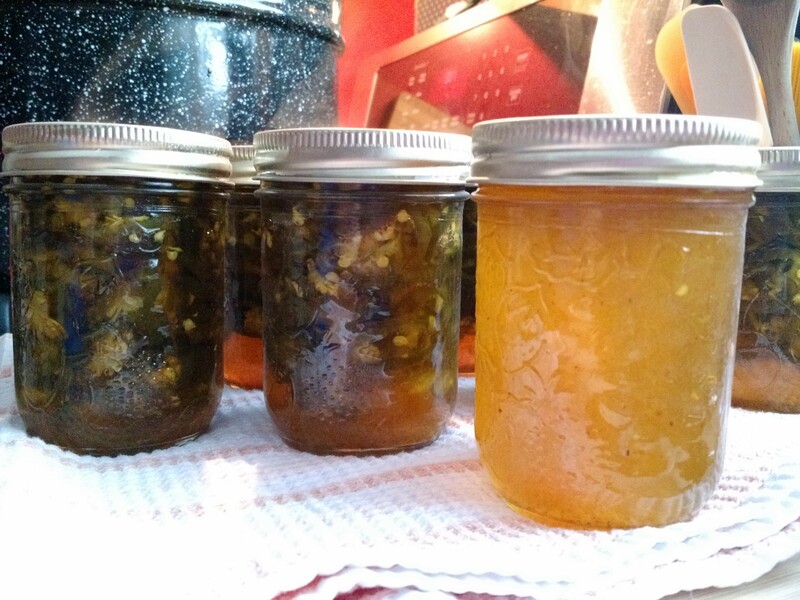 As you can see (sorta’) in the photo, I don’t pack them very tightly – I like each jar to have a bit of extra syrup in there – but that means the peppers will float a bit. I highly recommend that you wear gloves while working with any hot peppers – but I can’t force you to be sensible. Slice off the stems and tips from all of the peppers. Toss these into your compost bucket. Slice the peppers into uniform 1/4 inch rounds. I like to use my mandoline because I enjoy taking my life into my own hands around sharp blades. Also, it makes the slices very neat and tidy. But you can totally do this with a knife. Set the pepper slices aside. In a large pot, combine the cider vinegar, sugar, turmeric, celery seed, granulated garlic, and cayenne pepper. Over medium-high heat, bring this mixture to a boil while stirring. Add the pepper slices and simmer for exactly 4 minutes. For real. Time it. You don’t want them to get mushy and they’re going to get softer later when you process them. Use a slotted spoon and transfer the peppers into clean jars. Fill to about 1/4 inch line and pack them as tightly as you want them to be. Turn heat up in the pot and bring the syrup to a full rolling boil. Boil hard for 6 minutes. Time it. For real! Spoon or pour or ladle the boiling syrup into the jars – covering the pepper slices. Fill each jar to the 1/4 inch line. If you want to keep a jar or two of syrup, fill those up too! Wipe the rims of the jars with a damp paper towel – get all the goopy sticky seeds and whatnot off. There is no photo to accompany this post because, well, this was not an attractive recipe. My shoddy photography skills would have made it even worse. And since these turned out to be really delicious, I don’t want to scare you off with a hideous photo. At the age of 39, I realized that I have never made scalloped potatoes. I skimmed through a bunch of recipes, settled on one that didn’t sound bland, and decided to make it – with a few changes along the way. This came out delightfully spicy (which I like!) but you may want to adjust your ingredients to make it more, or less, spicy. If you don’t like any spice whatsoever, well, you may want to look for a different recipe. Melt butter in a medium saucepan, over medium heat. Add flour and cook, stirring constantly, for 1 minute. Whisk in the warm milk and continue whisking constantly for 3 to 5 minutes – or until beginning to boil and thicken. Add more flour, slowly, if needed to thicken. Remove the pot from the heat and whisk in the cheese, salt, oregano, cumin and pepper. Set the pot aside for a bit. Peel and thinly slice potatoes. Use a mandoline if you’re afraid of losing a finger. Arrange about one third of the slices into a thin layer in the bottom of a greased 9×13 baking dish. Spread half of the salsa on top of the potatoes. Repeat steps 5 and 6, making happy potato and salsa layers, then layer the remaining potato slices on top. Pour the cheese sauce over top to cover evenly and reach the sides and bottom of dish. Sprinkle with jalapeno pepper slices. Cover with foil and bake for 1 hour. Uncover and bake for another 30 minutes or until lightly browned. The potatoes should be tender. You can make this more, or less, spicy by choosing cheeses and salsas that are more or less spicy. You can also skip the jalapeno slices on top for less kick. I have no idea why you would want to make it LESS spicy, but, hey, it’s your dinner. Sweet Pickled Mu (Korean Radish). My husband really likes to eat the sweet pickled radish that garnishes his plate when we go out for sushi together. When we bought the ingredients for kimchi, we grabbed a second small Korean radish to use in an attempt to make something sweet and pickly at home. Korean radish is similar to daikon – but bigger and a bit tougher in the core. Here’s a photo of a Korean radish next to a Japanese daikon radish. Eating it raw is slightly peppery (like radish) but mostly a mild sweetness. Very crisp and crunchy! This was ridiculously easy to make – as most quick pickles are. My husband tasted it this morning (so, about 24 hours after I put it all in the jar) and declared that it’s exactly what he was looking for. We’re going to leave it out for at least another 24 hours before capping it and putting it in the fridge. Peel the radish and slice it in your preferred, ideally uniform, size. I used my mandoline for this and set it to 1/4″ french-fry slices. Avoid the core (it’s a bit tough, particularly in larger radishes). Put the slices into your jar. Fill it tightly, but there’s no need to pack it in. Mix the water, vinegar, and sugar together in a bowl. I used a mix of rice vinegar and regular white vinegar (about 50/50) but you could use either one on its own. When the sugar is dissolved into the mixture, pour it over the radish slices in the jar. Put your stopper and air lock in place. Since I was using an air lock, I didn’t worry much about fully covering the radish with the brine – as the radish softens, it starts to drop below the liquid anyway. If you’re not using an air lock, make sure to cover your radish completely (or weight it down under the liquid) to prevent mould. The flavour is sweet and tangy – not spicy or hot. If you are wanting hot spicy pickled radish, you can add a hot pepper to the jar (washed, stem removed) to the jar before adding the radish. I haven’t tried this. You can use ANY radish that you want in this recipe – the little round red ones from the grocery store, even! It’s a matter of what’s on hand, what you want the end result to look like, and what flavours you’re looking for. 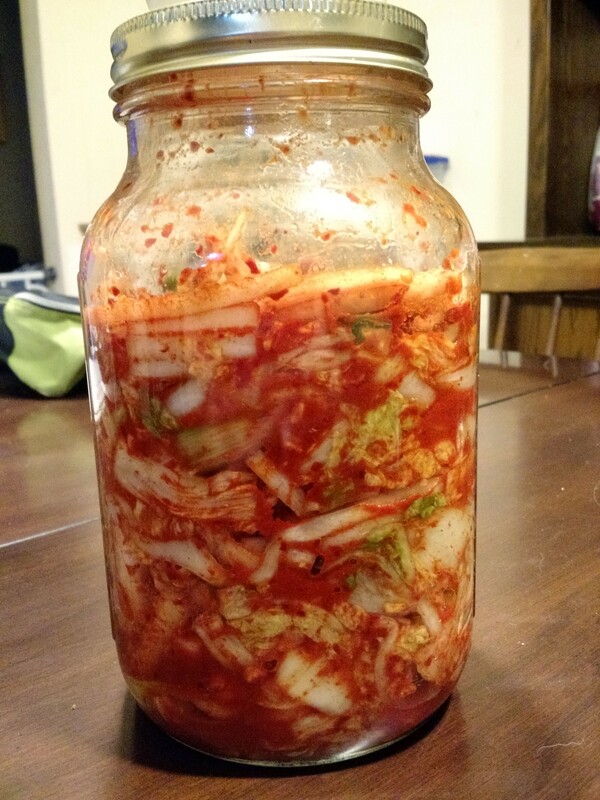 While my sauerkraut is bubblin’ in the jar, I figured I would try something a bit fancier – kimchi. The concept is exactly the same: chop stuff and ferment it. The difference is that kimchi includes spices and seasonings. This big jar will need to sit around for about a week before I taste it – by which time it should be really stinky and (hopefully) good. I started out shopping at the “Asian Superstore” in my city – where I promptly ran into difficulty with my lack of non-English reading skills. Specifically, I was looking for the gochugaru by trying to compare a google image of the word (in Korean) with various packages. And that store had hundreds of packages that could have been what I wanted. The store was busy enough that I literally couldn’t find anyone to help me – so I grabbed what looked approximately correct… and them promptly worried that I was going to create a disaster in my jar. When I posted my dilemma on Facebook, my friend Melle recommended a local store at which I was able to pick up the authentic ingredients; there are plenty of recipe variations out there, though, if you don’t have a local Korean shop. In this case, the lovely woman working at the store was also able to grab some napa cabbage for me from the secret stash in the back – and gave me some advice on ingredients. Awesome. Anyway. I’ll report back in a week or so as to how things turned out – in the meantime, here’s the recipe. Remove the outer leaves of the cabbage and cut out the core. Chop the cabbage into 2″-sized chunks and place in a large bowl. Sprinkle the salt over the cabbage and use your hands to work it in – crunching things up a bit as you go. Pour cold water over the cabbage, set aside, and let it soak overnight. Cover it with a clean dish towel or saran wrap to keep lint from getting in. The next day, rinse the cabbage with cold water. The leaves will have softened! Yay! Drain it well, squish out as much water as you can, and set aside. In a large bowl, combine all the other ingredients. To prevent staining (and hot pepper burning) wear gloves – I used nitrile gloves, but you can use latex or whatever’s handy as long as they’re clean. When everything is happily mixed, add the cabbage. Use your hands to squish it all together more – get everything well-coated and happily melded together. Pack it all into a 1.5 liter glass jar. Make sure it’s pressed down firmly. Put your stopper and airlock onto the jar, fill the airlock with water (see note), and set aside for a week. The hardest part of this recipe is all the chopping and mincing and whatnot. I totally ‘get’ why someone would make a triple batch to put off having to do it again soon. If this turns out well, and if I try to make another batch, I’ll at least double it. In recent emails with Geoff, from Canuck Homebrew Supply, I have learnt that water is not the most ideal thing to put into your air lock. There are some special products available (food safe) or you can use vodka! And who doesn’t love the idea of needing to buy vodka for healthy purposes? Not me, that’s for sure. You CAN use water, and I’d say it’s especially okay for a short-term ferment, but I am not a scientist and I do not play one on TV either. So.. yeah. Salted shrimp are possibly one of the grossest things I’ve ever seen, let alone put into a recipe, but people seem to swear by them so .. they’re in there. I will try not to think about their beady little eyes when I’m eating the kimchi later. And, finally, if you can’t find any regular mouthed 1.5L jars (I used wide-mouth because I already had some) you can make an adapter for your #13 stopper using a yogurt lid. Yes, for real. Here’s the instructions for that. I made my inner circle the size of the stopper, rather than a smaller jar lid, and it worked beeee-yooo-tifully. At least, so far. Sauerkraut and her friend Carrots. 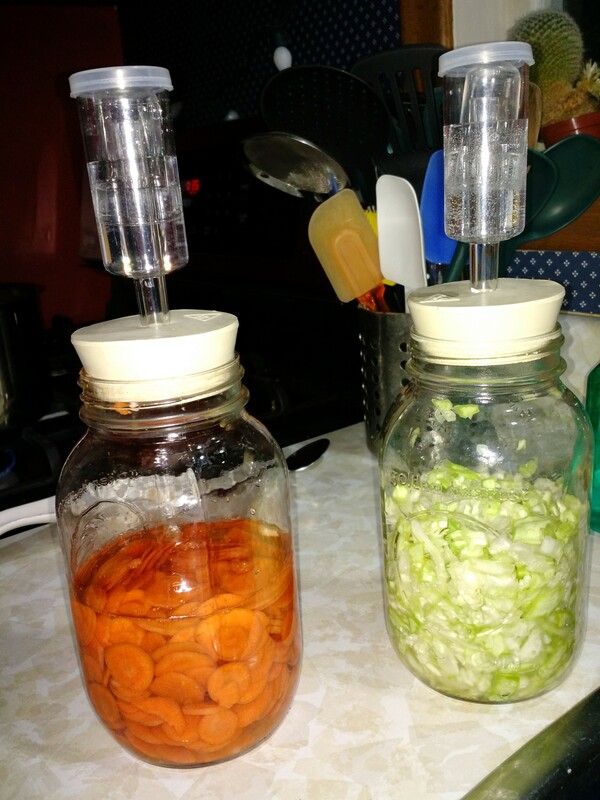 After getting the sauerkraut started, I decided to whip up a small batch of carrots to ferment, too. 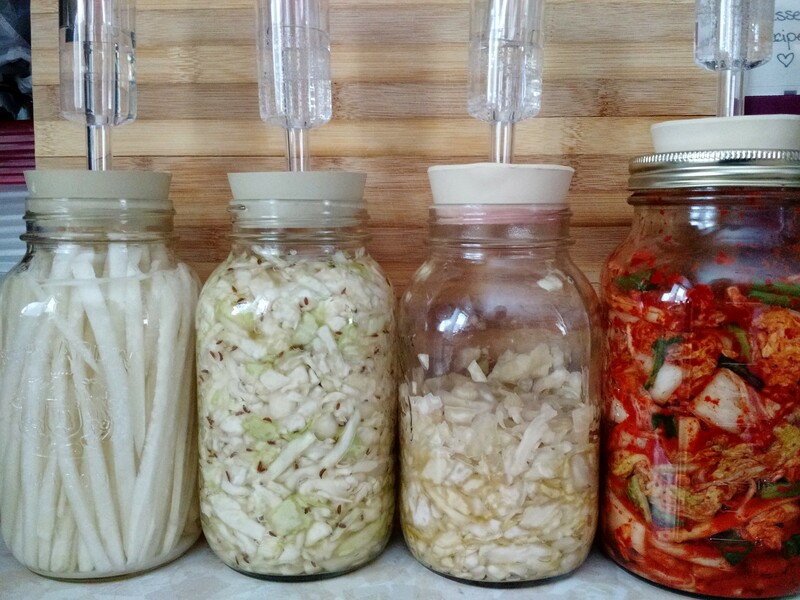 I used the same physical setup as the sauerkraut – a 1 quart mason jar, air lock, and #13 drilled stopper (bung? ha!) ordered from Canuck Homebrew Supply. Using my mandoline, I sliced the carrots into uniform sized chips and did the same with the garlic (being really careful not to mandoline off the tips of my fingers). I mixed the salt in, waited a few hours, then added just enough water to cover the top of the carrots. By the next morning, happy little bubbles were already starting to form! Slice the carrots into uniform chips – I used a mandoline. Do the same with the garlic. In a small bowl, combine the carrots, garlic, and salt. Use your hands to squish them together and crunch them up a bit. Put the carrots and garlic into your clean mason jar – including any carrot or garlic juices that were made during the crunching process. Leave it in a warm spot for a few hours – until there’s a decent puddle of carroty juice in the bottom of the jar. Add enough water to cover the carrots in the jar. Put your stopper into the jar and add your air lock – add water to the air lock. Set aside for a few days. You can watch the bubble form on the 2nd day – this is a good sign! Taste as often as you like – until it tastes good to you – and then put a regular lid on and store in the fridge. Instant Pot Sushi Rice + Maki. violetu on Underpants Are Fun-derpants! Michelle P on Underpants Are Fun-derpants!